Bitcoin has suffered a huge loss and it could be speculated as a collateral to the upcoming hard fork of Bitcoin Cash [BCH]. Bitcoin [BTC] is trading at $5477 with a market cap of $96.78 billion. The trade volume has seen an exponential rise to $7.61 billion which is contributed mostly by BitMex [~39%]. The uptrend for Bitcoin spans from $5205 to $5460, while the downtrend ranges from $6220 to $5417 and ends at $5205. The support, however, is at $5205 and the resistance has formed at $6220. The subsequent resistances are at points, $6320, $6390 and $6520. The MACD indicator is showing a bullish crossover as the MACD line has crossed above the signal line, while the histogram represents the same. The Stochastic indicator is showing a bullish crossover, and it is rising higher reaching the overbought zone. The Chaikin Money Flow is seen above the zero line indicating a shift in momentum to the buying zone. This means that the money is flowing into the market. The uptrend in the long-term is absent. 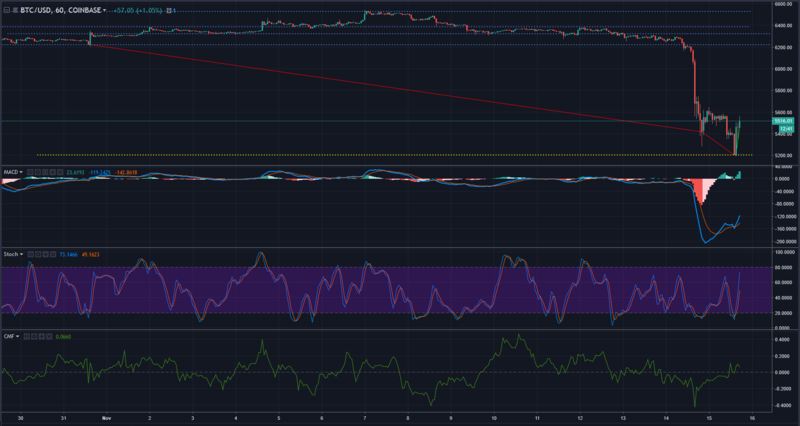 The downtrend has spawned and ranges starting from $8390 to $6505 and has further extended until the $5605. The two supports set up previously at $6145 and $5850 have been broken. The new resistance points are at set up at points $6750, $6525, $7360 and $8320. The Parabolic SAR markers have spawned above the price candles indicating a bearish pressure looming over Bitcoin. The Relative Strength Index has broken the RSI bands and have collapsed into the deeper end, indicating an oversold market. The RVGI is undergoing a bearish crossover indicating a bear pressure in the market. The one-hour chart as indicated by the MACD, Stochastic and CMF show a bullish trend incoming. The one-day chart unlike the one-hour chart shows a bearish presence. 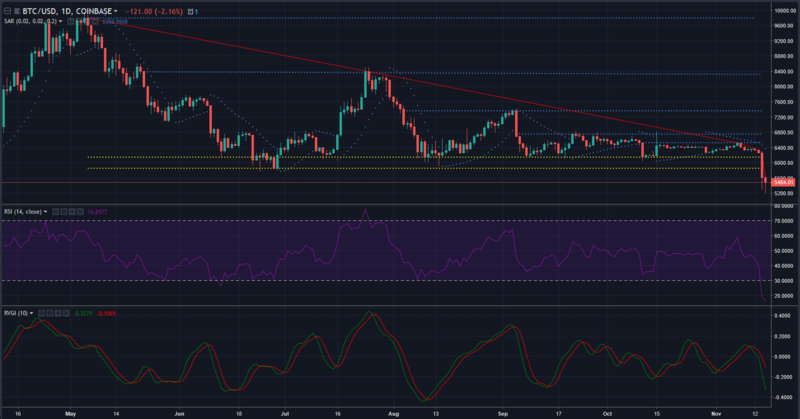 The post Bitcoin [BTC/USD] Technical Analysis: Bears’ jab knocks bulls out of the ring appeared first on AMBCrypto.